“Good teachers provide good answers, but exceptional teachers ask great questions.” In the Gospels, Jesus asks over 100 questions. 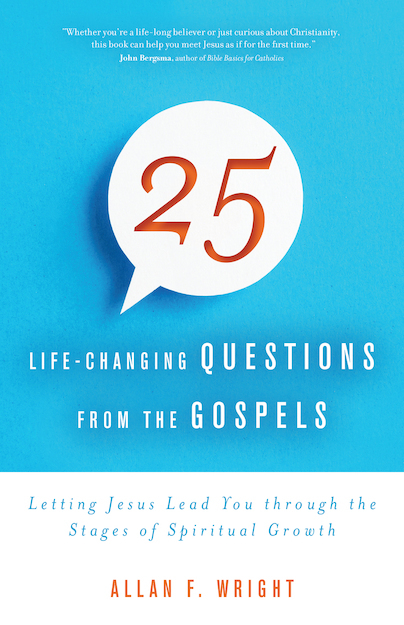 Allan F. Wright, academic dean for evangelization at St. Paul Inside the Walls and an adjunct professor of biblical studies at Seton Hall University, chooses 25 of these questions to dissect and reflect on in 25 Life-Changing Questions from the Gospels: Letting Jesus Lead You through the Stages of Spiritual Growth (Ave Maria Press, 2016). Even when taken at face-value in our modern English translations, Jesus’ questions provide much food for thought and spiritual development. Wright utilizes his knowledge of the original biblical languages and understanding of the culture in Jesus’ time to provide valuable insights into these questions. In many cases, the already powerful questions gain an even deeper meaning when one considers this additional information. For example, the story of the Good Samaritan is one of the most familiar parables in the Bible. Wright provides the back story that we may not be aware of. He examines the motivation of the lawyer who asks, “Who is my neighbor?” He explains the terrain of that particular road from Jerusalem to Jericho (it’s relevant) and the reason the priest and the Levite would have been traveling it as well as why they would not have wanted to touch the injured man (maybe we should not judge them so hastily. Given the circumstances, would be any different?) He also discusses the robber victim’s foolishness in traveling alone on this treacherous road – a fact that would not have escaped the original audience’s notice. 25 Life-Changing Questions from the Gospels is both fascinating and spiritually enriching. Jesus asked these questions of his first-century listeners, but he also asks them of us. Wright’s reflections can help us to form our own answers to these questions and change our behavior accordingly. Each chapter includes questions for either personal or group use. This would be a wonderful choice for any Catholic Bible study or book group.